What a start to 2019! For the fifth year running the Flic team went to CES, the global stage for innovation and the world’s gathering place for all those who thrive on the business of consumer technologies. Not only did we get to show hundreds of people what Flic is and open their eyes to the power of using a smart button, but we also got to see first hand some of the latest tech that’s set to shape future. From foldable TVs and phones, enhanced virtual reality, self-driving cars, all the latest smart home gadgets, more wearables than you could fit on your body and everything else in between, CES was a feast of innovation and inspiration. 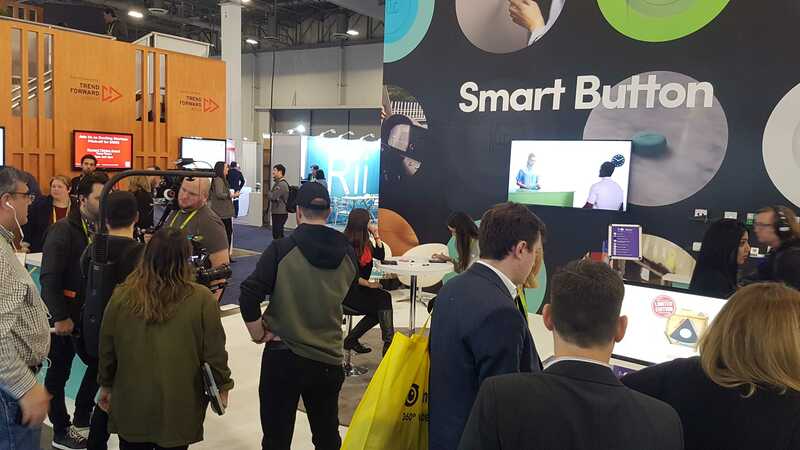 Here are five things we learned from CES 2019…and our advice to any company who are thinking of exhibiting there next year. 1. Technology must serve a purpose. Just because we can do something, it doesn’t always mean we should. Technology for technology’s sake isn’t going to cut it anymore – new products have to serve a purpose and enhance the lives of the end users. Startups that add technology or the word “smart” to things just because it hasn’t been done before are less common now at CES. You can still find a smart pet toilet, smart nail polish, even a smart pepper spray… but more companies are starting to think if there really is a value in making something smart before selling it. 2. The smart home battle is hotting up. Google had a huge presence at CES as it looks to make 2019 the year Google Home and Google Assistant become integral parts to the lives of millions. Of course, in the opposite corner, is Amazon and Alexa, who already have the larger market share. The good news for the consumer is more devices than ever before support both options so, ultimately, the customer wins. 3. AI will be everywhere. Following on from the above, AI is becoming integrated with everything – from TVs automatically changing their settings based on light conditions to golf clubs tracking shots and displaying stats in an app. Traditionally, we’ve viewed artificial intelligence as the ‘robots’ of the future. In reality it’s different and more subtle – AI will exist everywhere, in everything. 4. 5G is nearly here. 5G will be at the heart of automation and AI while, at the same time, bringing users greater speeds and greater capacity. We’ve already been close to the action with Sweden’s first 5G network being tested on the KTH campus where our office is. This was our fifth year at CES and we moved up a floor, away from the startup section, to take our place among the more established companies. This meant a bigger booth and harder work but also lots more people with questions about Flic. Our booth design made a big difference here, too. – Provide a demo people can use without having to ask – some people like watching/reading before actually asking somebody. Our demo was a set of Flic buttons to control our presentation, showcasing case studies, what our clients use Flic for, how you can get your company’s logo on Flic buttons, and our famous video (which we made available offline as the internet at CES is a little unreliable). – Set up for press to come to your booth, have a nice spot for interviews, make your booth photography worthy! – Create a space with a few comfy chairs and a table if you have room – this worked for us because walking around a fair all day is tiresome and people want to take a load off – it was the perfect way to get people to our booth! It’s also perfect for meetings. You can have people come to you so there’s no need to meet in the noisy food court. – Drive everyone you meet to your website or social media – we did this by running a Flic giveaway on our social channels. – Everyone has a smartphone so allow people to take pictures of business cards with their phone which will save paper and save you printing a ton of cards. We ran out of them! – Stay close to the conference venue. Our hotel was within walking distance of the Sands Expo, so we even went home for lunch! It’s nice to get some fresh air and have a break.